The Christian religion is not an otherworldly, eternal doctrine about the nature of deity or a polite philosophical discussion about the relation of spirit to matter. Instead, it is the historical unfolding of God’s covenantal involvement in this world, the culmination of which is God’s coming into this world in the person of Jesus Christ. Far as the Curse is Found is a retelling of the biblical story of God’s unfolding covenant from creation to new creation. Readers are led to wonder anew at the redemptive work of God in our own history, in our own human flesh. Pastors, students, and those interested in biblical theology are among the many that will gain fresh insight into the biblical story of redemption. I can't think of anything more important for the preaching, teaching, and study of the Bible today than that students of that Word be immersed in the wonderful, beautiful, and powerful story of God's covenant. Mike Williams has made a valuable contribution to this end...Drawing from a wide range of Reformed and evangelical scholarship, and rooting his discussion firmly in the Scriptures themselves, his account is unique in its approach, thorough in its development, compelling in its argument, and timely in its arrival. I recommend it highly. 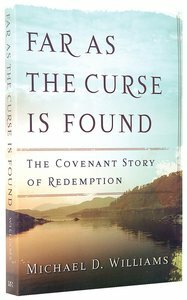 About "Far as the Curse is Found"
A retelling of the biblical story of God's unfolding covenant relationship with his treasured people, to whom God comes and whom he redeems. Michael D. Williams (PhD, University of Toronto) Professor of Systematic Theology was an adult convert to the Christian faith, Dr. Williams was a professor of theology at Dordt College for six years before joining Covenant Seminary's faculty in 1996. Dr. Williams has a strong reputation among Reformed and evangelical theologians. He has written particularly in the areas of the nature of theology and theological method, and history. Dr. Williams served as a youth pastor for three years. His publications include This World Is Not My Home: The Origins and Development of Dispensationalism, Why I Am Not an Arminian (with colleague Robert A. Peterson), and Far as the Curse is Found: The Covenant Story of Redemption. Customer Reviews For "Far as the Curse is Found"
An engaging book exploring the biblical theology of covenant and God's gracious salvific plan, witnessed throughout Scripture. From creation to re-creation Williams incorporates strong theology with thoughtful clarity, inviting the reader to celebrate the redemptive purpose of covenant partnership. His writing is both accessible and thought provoking, making it an essential reading for anyone interested in exploring the biblical theme of covenant.